Andrew Joseph Armstrong (1873 - 1954), pictured in his doctoral robes, is standing in the Browning Room, the original home of the Browning collection at Baylor University. 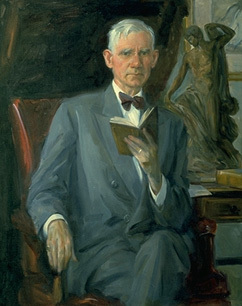 It was his small collection of Browning books, which he donated to Baylor University in 1918, that initiated a desire to amass the world's largest Browning collection at Baylor. Through Dr. & Mrs. Armstrong's indefatigable diligence, this dream, along with the unique building in which it is housed, became a reality. Dimensions: 54 1/2" x 46"
Notice Robert Browning's intaglio ring on Armstrong's little finger--a ring that the poet wore for over forty years. Armstrong took great pride in wearing the mementoe while he taught his Browning course. On occasion, he would knot the ring into his tie. Armstrong's piercing gaze was long remembered by his students, not always fondly, but always with respect. 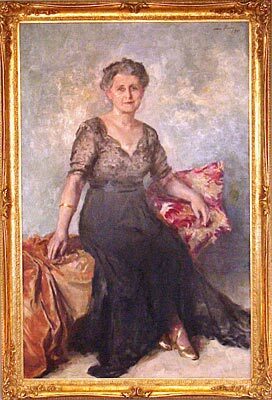 Mary Maxwell Armstrong (1882 - 1971), wife of the founder of the Browning collection, is well remembered for her lectures on Browning's notoriously difficult poem, Sordello. She worked closely with her husband as they raised money through educational tours and cultural events to build the Browning collection at Baylor University. Much of the beauty and elegance of the Armstrong Browning Library is attributed to her influence. Marrs McLean (1883 - 1953) and his wife, Verna, were the donors of the Foyer of Meditation in the Armstrong Browning Library. McLean, a Beaumont oil and gas developer, moved to San Antonio in the 1930s to turn to politics. He was one of the members of the Building Committee for the Library and a major supporter of Baylor University. The Rena Marrs McLean Physical Education Building, given in memory of his mother, was dedicated on the Baylor campus in October 1938. He received an honorary degree from Baylor in 1951. Verna Hooks McLean and her husband were the donors of the beautiful Foyer of Meditation in the Armstrong Browning Library, and she was instrumental in acquiring the spectacular 18th-century Chinese temple jars for the room. She and her daughter established the Corrie Herring Hooks Series at the University of Texas Press in honor of their mother and grandmother, a lifelong nature lover and conservationist; and, after her husband's death, Mrs. McLean provided the funds for the Marrs McLean Science Building on the Baylor campus. She died in 1991 at the age of 98. Pauline (Mrs. Abner P.) McLendon of Waco, Texas, provided a generous donation that made it possible for A. J. Armstrong to secure for the Browning Collection the rare first edition of Robert Browning's first publication Pauline, (1833). Her portrait hangs in the Austin Moore-Elizabeth Barrett Browning Salon near many of the pieces of furniture that she provided for the room. The famed Broadway actress first came to Baylor in 1934 to perform in The Barretts of Wimpole Street. One of Armstrong's great accomplishments was bringing cultural events to the Waco and Baylor community. A friendship developed between the Armstrongs and Miss Cornell, and she returned to Baylor in 1951 to participate in dedication ceremonies for the Armstrong Browning Library. During the ceremonies she presented a shadowbox replica of a scene from the play. In later years, several original Browning items were gifts of her estate.